EIDIA House announces the 29th initiative of its ongoing PLATO’S CAVE exhibition, started in 2009. This special holiday salon will feature works from Bob Witz’s wry and witty “Milk Carton” series as well as painting portraits of characters conjured from the artist’s deeply esoteric imagination. The result of a meditation inspired originally by the lunches Wit’z mother prepared for him as a child in Tomah, Wisconsin, “Milk Cartons” - we dare to propose - is a more subversive twin to Warhol’s Soup Cans. It is an honor for EIDIA House to curate and install Bob Witz's work in the Plato's Cave vault space. While many of the sculptures exist in private and public collections, it will be the first ever exhibit of the near total compilation of Witz's "Milk Carton" series, dating back to the 1980’s and including a number of works created in 2018. Bob recounts the origin story in his characteristic wry terms: "One day, I had this milk carton and an orange juice container and I thought I’d make some art of it." To further commemorate this often overlooked artist, EIDIA is also in the process of making a documentary film on Witz, a mainstay of New York’s downtown scene in the 1970’s and 80’s. 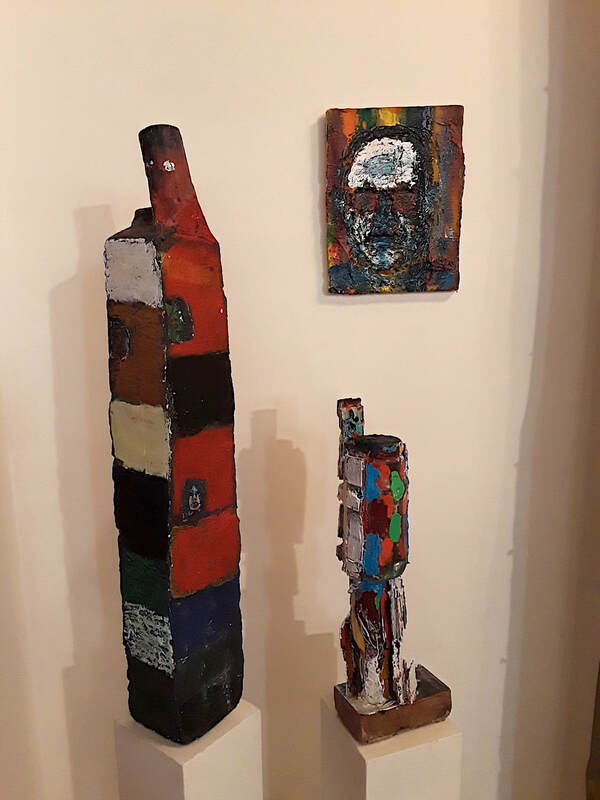 The film (Bob Witz Untitled) will feature Witz’s paintings and sculptures, and the literary arts publication “APPEARANCES” to capture the artist’s – still at work in his modest one room studio loft - compelling and ever-unfolding story. Including interviews with fellow artists, colleagues, scholars and friends, the film is also a portrait of the artistic circle that spanned the 60 years of Witz’s enduring art practice. For PLATO’S CAVE, EIDIA House Inc. co-directors Melissa P. Wolf and Paul Lamarre (aka EIDIA) curate invited fellow artists to create an installation with (in some cases) an accompanying limited edition. EIDIA House functions as an art gallery and meeting place, collaborating with artists to create "socially radical" art forms framed within the discipline of aesthetic research. All milk cartons, average dimensions, 13 to 16inch x 5 x 5inch, are for the most part unsigned, untitled, unmarked—of found materials: milk cartons, frozen orange juice cans, wood, acrylics and oil pigments with some duplicated in cast bronze. “L’Origine du Monde” 2016, Alexander Melamid, retitled “Diptych” 2018. EIDIA House announces its continuing exhibition initiative 2018, Plato’s Cave #28. 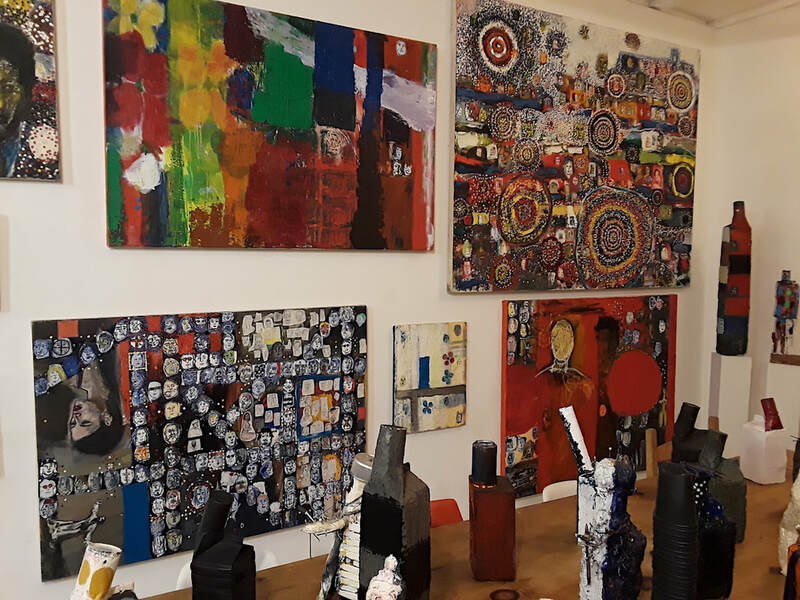 Artists: Todd Ayoung, Bruce Barber, Jay Batlle, Fredie Beckmans, BOLDFACE, Brad Buckley, Deric Carner, Alberto Casais, Jim Costanzo, Michelle B. Duchamp, Jeff Goldberg, Heike Hamann, Irene Hug, Helen Hyatt-Johnston, Thatcher Keats, Nina Kuo, Cecilie Beck, Sean Lowry, Valerian Maly, Alexander Melamid, Lorin Roser, Mark Shorter, Clark Stoeckley, Ripley Whiteside, Hans Winkler and Bob Witz. Due to the deep philosophical and psychological ‘aspects’ that are the subject of this exhibition we restrict the viewing of ASSHOLES to individuals who are older than 18 year of age. We apologize. Alexander Melamid presented his oil on canvas diptych to EIDIA House just after it was completed in 2016—a homage in the 150th anniversary of the creation of “L’Origine du Monde”, 1866, the masterpiece by Gustave Courbet. As the diptych hung in the EIDIA House it consistently “struck a cord” garnering considerable ‘notice’ and comment from our many colleagues and friends who drop by. With assholes a-buzz, Melamid suggested a Plato’s Cave exhibition of many offerings on the topic. Considering the abundance of contemporary models to take inspiration from, why just two assholes? An esteemed roster of artists quickly emerged advancing their own personal renderings on the topic. As with the assholes that predominated in Courbet’s time, and now in ours, the social media landscape of intentional divisiveness has opened the ‘fowl-mouth’ floodgates and a vogue for, if you will ‘assholeism’. And from where artists sit proverbially on our asses stunned and enraged—inspiration runs like diarrhea—unceremoniously depositing a theoretical groundwork for the examination of who and what ‘make the world go- round’. The contributions we have receive suggest that these curator’s fingers pressed the right mental “sphincter” muscle that reveals there are too many ASSHOLES. Given the times we live in, with man and his history constantly repeating itself, the current situation calls for more critique on Assholes—not less.